The work done through GO-E ranges from conducting vision screenings and performing surgeries in underdeveloped countries to training other health care providers and patients in multiple countries. GO-E also travels years to South Georgia to provide to migrant farmworkers’ children, who lack quality eye care and have higher-than-normal occurrence of eye disease and preventable blindness. - The cost is extremely high — economically because of medical costs, but also socially because of isolation, job loss, reduced independence, and lack of confidence. The numbers are staggering, but there is hope. More than 80% of blindness worldwide is either preventable or curable. That means vision screenings and proper care can help eliminate — or at least reduce — some types of blindness. 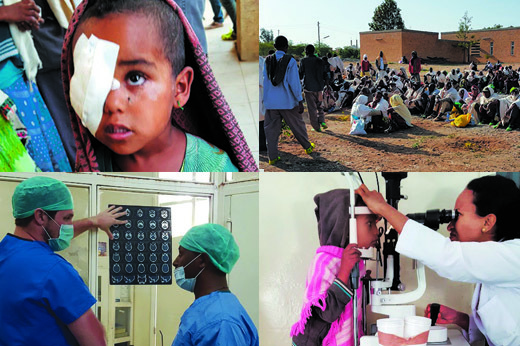 Based out of Emory's Department of Ophthalmology, Global Ophthalmology Emory (GO-Emory, or GO-E) supports a goal that's simple to state, but complex to execute: to help eliminate avoidable blindness by the year 2020. The program in line but what faculty and students have been doing on their own for years — traveling to rural areas and abroad to provide emergency care, eye clinics and education — but was formed in an effort to organize such efforts. The work done through GO-E ranges from conducting vision screenings and performing surgeries in underdeveloped countries to training other health care providers and patients in multiple countries. Optometrist Farah Gulaid, OD, traveled to Ghana in late 2016 to help provide vision screenings — and the group saw approximately 4,000 patients during four days in clinic. It’s also refreshing for physicians to learn new things themselves instead of only being the teacher. Glaucoma specialist Annette Giangiacomo, MD, saw this firsthand during a weeklong trip to Ghana. She worked with two pediatric physicians and three fellows to assess and treat children with glaucoma. From a GO-E perspective, however, “global” doesn’t always mean “international.” There are people right here in Georgia who lack access to quality eye care and have higher-than-normal occurrence of eye disease and preventable blindness. One way GO-E is trying to change that is through yearly screenings of migrant farmworkers’ children in rural South Georgia. Approximately 53,000 migrant seasonal farmworkers live and work in Georgia, but many have limited access to health care. They are at significant risk for eye injury and disease because of their work, so the Farmworker Vision Project (FVP) began in 2014 to address their ophthalmologic needs. Pediatric ophthalmologist Phoebe Lenhart, MD, and others participate in a pediatric vision screening initiative as part of a program organized by the Emory School of Medicine and the Emory physician’s assistant program. They screen hundreds of children for vision problems and eye disease, and offer full follow-up exams for children who have problems identified through the screening. They’re also able to provide children with free eyeglasses through the Georgia Lions Lighthouse. In an effort to keep FVP’s work going year-round, several staff workers from the General Consulate of Mexico in Georgia have been trained to provide pediatric vision screenings. The program expanded to include adult eye health screenings in 2015. The Emory group hopes to continue working with the local Consulate to offer greater access to eye care for all migrant workers in the state. “This has been a great opportunity to serve a pediatric population with vision needs and limited access to eye care,” Lenhart says. Many of Emory Eye Center’s faculty and students help care for a completely different population group through the diabetic retinopathy program at Grady Memorial Hospital in Atlanta. Diabetes affects more than 29 million Americans, and often puts patients at higher risk for blindness and other vision problems. Diabetic retinopathy is the most common cause of vision loss among people with diabetes. The program began in August 2016 and is already successful enough to implement at other Emory Eye Center locations. More than 1,700 people were screened between August and December 2016. Of those screened, 48% had some eye pathology, 27% had diabetic damage to their eyes and 5% had vision-threatening disease, meaning they would have lost their vision if the disease hadn’t been found. The year 2020 is coming soon, but O’Banion and others who support GO-E are optimistic about their chances of reaching their goal.